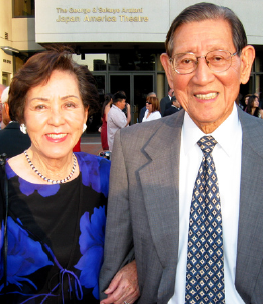 George and Sakaye Aratani are philanthropists who focus in supporting organizations that work with Japanese and Japanese American causes. Their generous contributions to the UCLA Terasaki Center for Japanese Studies have created the George and Sakaye Aratani Fellowship and the George and Sakaye Aratani Field Experience Fellowship. The Aratani Foundation has supported dozens of Japanese American organizations and programs, mostly based in Southern California, but also some nationally-based ones. A number of physical spaces within Los Angeles's Little Tokyo have been named after the couple, reflecting their monetary support. Notable ones are the Japanese American Cultural and Community Center's Aratani Japan America Theatre; the Japanese American National Museum's George and Sakaye Central Hall; and the Union Center for the Arts's Aratani Courtyard. In 1983 Sakaye received the Order of the Sacred Treasure, Fourth Order from the Japanese government. Five years later, George would get his own kunsho medal, Order of the Sacred Treasure, Gold Rays with Rosette. The couple resided in Hollywood Hills, in the same home custom built for them by Sakaye's brother-in-law in 1958. Aratani passed away on February 19, 2013 at the age of 95.